There is a thesis that the banks are in control of the Fed and as a result had gained control over the issuance of the currency of the US. 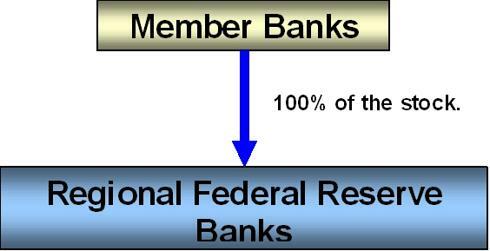 This thesis is based on the fact that the shares of the Federal Reserve Bank are held by these private banks. Does that mean that the private banks own the Fed? The holding of this stock, however, does not carry with it the control and financial interest conveyed to holders of common stock in for-profit organizations. It is merely a legal obligation of Federal Reserve membership, and the stock may not be sold or pledged as collateral for loans. Member banks receive a 6 percent dividend annually on their stock…. This is exactly the manner in which Special Purpose Vehicles (or Special Purpose Entities) are created in the corporate world. There is usually a promoter who does not wish to be seen to own an entity but who wishes to derive some benefit from the existence of such an entity without the burdens of ownership, which more often than not, would adversely impact on the presentation of its financial reporting. The authorities and regulators, including the Fed, are very aware of these structures, as are the accounting profession and rules that have been devised and implemented to assess any such arrangement to establish its true nature. It is therefore appropriate to assess the Fed independence or, alternatively, interdependence, according to the very rules that it uses to assess Special Purpose Entities. First let’s draw the simple ownership structure. Anyone with a rudimentary knowledge of accounting principles would know that ownership of an entity without control over that entity requires further investigation. Consolidation of a group of companies can become complex when ownership and control are split. Ownership will be ignored and focus will be shifted to control according to GAAP (Generally Accepted Accounting Principles). For example, a right to appoint the majority of the Board of Directors even in the absence of ownership would trigger a consolidation of that entity. Thus the controller and the entity would be seen as part of a group and collectively as a single interdependent consolidated entity. 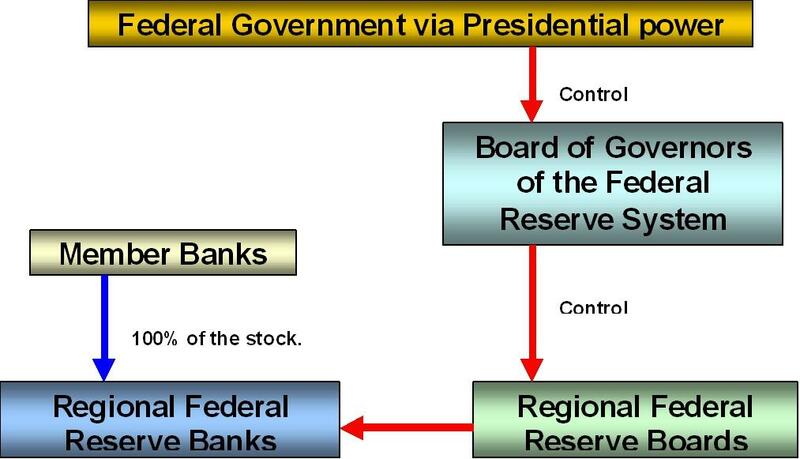 It follows that the above simple structure of the Federal Reserve Banks is a split structure where “ownership” is of limited significance and “control” must be established. Control will tell us whether the entities are independent or interdependent. All regulation targets “control” and not just the legal form of ownership. Accounting principles of consolidation have evolved from Special Purpose Vehicles, to Special Purpose Entities and very lately with the revision in June 2009 for implementation in January 2010 of Financial Accounting Standard 46(NYSE:R) (“FIN 46(R)”) to the concept of a “Variable Interest Entity”. significant to the variable interest entity or the right to receive benefits from the entity that could potentially be significant to the variable interest entity. The first test is to check for “the power to direct the activities…” Who exactly holds that power? Here we turn to the Federal Reserve Act, which instructs the Regional Federal Reserve Banks to elect each their own Board of Directors of which the Chairman and Vice Chairman of the Regional Board will be appointed by the Board of Governors of the Federal Reserve System. The Regional Boards must have nine directors in 3 classes of 3 each (A, B and C directors). Three A directors chosen by the stockholders; three B directors to represent the “public”; and three C directors to be appointed by the Board of Governors of the Federal Reserve System. The Board of Governors of the Federal Reserve System will appoint the Chairman and Vice Chairman from the ranks of the three C directors. Said board of directors shall administer the affairs of said bank fairly and impartially and without discrimination in favor of or against any member bank or banks and may, subject to the provisions of law and the orders of the Board of Governors of the Federal Reserve System, extend to each member bank such discounts, advancements, and accommodations as may be safely and reasonably made with due regard for the claims and demands of other member banks, the maintenance of sound credit conditions, and the accommodation of commerce, industry, and agriculture. The Board of Governors of the Federal Reserve System may prescribe regulations further defining within the limitations of this Act the conditions under which discounts, advancements, and the accommodations may be extended to member banks. The Regional Boards are limited in their abilities to perform the primary functions of the Regional Federal Reserve Bank in terms of the act and under the control of the Board of Governors of the Federal Reserve System. It is clear from the Federal Reserve Act that control does not vest in the Regional Federal Reserve Boards, nor are they independent but they take instruction and are controlled by the Board of Governors of the Federal Reserve System. It is now appropriate to update the simplified structure above to add these two steps of control. The question of “who has control?” is not yet resolved as the nature of the Board of Governors of the Federal Reserve System must be investigated next. Is the Board of Governors of the Federal Reserve System an independent body or beholden to another entity? The Board of Governors of the Federal Reserve System is a federal government agency. The Board is composed of seven members, who are appointed by the President of the United States and confirmed by the U.S. Senate. The Chairman and the Vice Chairman of the Board are also appointed by the President and confirmed by the Senate. The nominees to these posts must already be members of the Board or must be simultaneously appointed to the Board. The Board of Governors of the Federal Reserve System is a federal government agency and power to appoint all its members, Chairman and Vice Chairman is vested in the President of the USA, with a veto power over any appointment for the Senate. The first requirement for a “variable interest”, “the power to direct the activities…” is answered in the affirmative. Federal government at Presidential level holds “the power to direct activities”. The next requirement which must be met for a “variable interest” is any one of (i) an “obligation to absorb losses” or (ii) a “right to receive benefits”. I would argue that the right to create currency granted to the Fed together with the vested interests of Federal Government are more than sufficient to infer an “obligation to absorb losses”. The Federal Reserve Act adds a complication to this argument by holding the shareholders responsible to the extent of their stockholding for the liabilities of the Regional Federal Reserve Banks. The “obligation to absorb losses” is not a requirement that needs to be met, provided that the alternative “right to receive benefits” requirement is met and since it is not clear cut, it is better to concentrate on the latter right. Note that the obligation or the right need not be an absolute. Again we can turn to the two sources, the Federal Reserve Act and the Fed publication Federal Reserve System Purposes & Functions for guidance. A. After all necessary expenses of a Federal reserve bank have been paid or provided for, the stockholders of the bank shall be entitled to receive an annual dividend of 6 percent on paid-in capital stock. B. The entitlement to dividends under subparagraph (NYSE:A) shall be cumulative. 2. That portion of net earnings of each Federal reserve bank which remains after dividend claims under subparagraph (1)(A) have been fully met shall be deposited in the surplus fund of the bank. (b) Transfer for fiscal year 2000. 1. The Federal reserve banks shall transfer from the surplus funds of such banks to the Board of Governors of the Federal Reserve System for transfer to the Secretary of the Treasury for deposit in the general fund of the Treasury, a total amount of $3,752,000,000 in fiscal year 2000. 2. Of the total amount required to be paid by the Federal reserve banks under paragraph (1) for fiscal year 2000, the Board shall determine the amount each such bank shall pay in such fiscal year. During fiscal year 2000, no Federal reserve bank may replenish such bank's surplus fund by the amount of any transfer by such bank under paragraph (1). The income of the Federal Reserve System is derived primarily from the interest on U.S. government securities that it has acquired through open market operations. Other major sources of income are the interest on foreign currency investments held by the System; interest on loans to depository institutions; and fees received for services provided to deposi­tory institutions, such as check clearing, funds transfers, and automated clearinghouse operations. After it pays its expenses, the Federal Reserve turns the rest of its earn­ings over to the U.S. Treasury. About 95 percent of the Reserve Banks’ net earnings have been paid into the Treasury since the Federal Reserve System began operations in 1914. (Income and expenses of the Federal Reserve Banks from 1914 to the present are included in the Annual Report of the Board of Governors.) In 2003, the Federal Reserve paid approxi­mately $22 billion to the Treasury. The statement “about 95% of the Reserve Banks’ net earnings have been paid into the Treasury since the Federal Reserve System began operations in 1914” says it well enough. It is an irrefutable fact that the Federal Government is the overwhelming recipient of the “right to receive benefits”. The outright undisputable conclusion is that the Fed, when tested against GAAP as is used by it in it’s assessment of those it regulates, is a Special Purpose Entity of Federal Government or according to the latest definition is a Variable Interest Entity of Federal Government. The rules of consolidation therefore apply and the Fed must be seen as controlled by Federal Government, indivisiably part of Federal Government. The pretence of independence is no more that that, a pretence. There is, however, no denying that the banks have tremendous vested interest in influencing the policies of the Fed and that the power so narrowly vested in the President makes the President a special target for influence. Still, the power to control the Fed is not in the hands of the “owners” but firmly in the hands of Federal Government and the President of the USA. [ii] Financial Accounting Standards Board of the Financial Accounting Foundation; Connecticut, No 311; June 2009, Statement of Financial Accounting Standards No 167.